If there is you are interested in equipment and services, please feel free to contact us. Request and of the sample cut, tour of the cutting system is also possible. I ask about demand of you carefully for the best proposal. Based on the demand, we make the suggestions of optimal solutions and quote.In addition it is also possible to view our demonstration of ACS cutting machine. After the specification has been determined, it’ll make a formal estimate. If you acknowledge an estimate, we will proceed to the contract procedures. After your agreement, we will deliver the product in the normal two months.However, because of the complete build-to-order manufacturing, and it may vary depending on the situation.We will manufacture the equipment while performing careful quality control and process verification. After the quality confirmed by delicate inspection, we will deliver.Not only in the company of equipment, it is also possible to carry out the installation of the machine to the best places depending on the purpose.In addition I will also machine training. We are shipping with confidence in the quality.But still, if the machine trouble occurs within a period of one year from the purchase, you will receive a free maintenance service.If was further contract the annual maintenance, you can receive periodic inspection.it can prevent mechanical troubles and will be able to go use comfortably. When following of like, please feel free to contact us. First of all I want to try or materials and shapes can be cut. 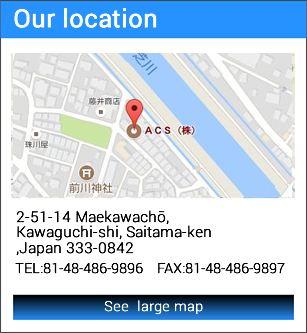 →gotten sending material and data, it is also possible to perform the sample cut. The machine of performance and usability First I want to see once. → You can check the machine and cutting in our demonstration room. Please contact us.